Key Lime Kind of Day, originally uploaded by captainjay. So Deb and I took today and tomorrow off. 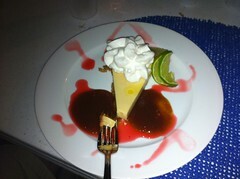 We have the boat running and met up with some friends in the BVI so after a "small" lobster we just had a little Key Lime Pie. Life is good. Since the band forgot to bring their instruments over from Tortola, just can't make this stuff up, we are heading back to the boat.